We are increasing the allocation to gold from 20% to 30% ahead of what we expect will be a strong period for precious metals in the months ahead. Our Active Asset Allocator is now positioned 20% equities / 50% bonds* / 30% gold. 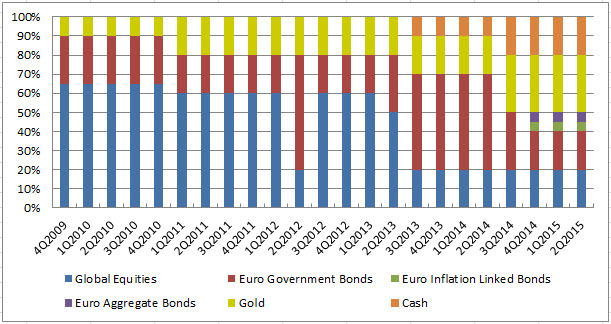 (Bonds now include euro government, corporate, inflation linked and absolute return bonds). The S&P 500 has put in a powerful rally to recover from the sharp -10% correction in October. The move so far has been straight up without correction. In fact, coming off a six month low, for only the second time since 1928, the S&P 500 traded above its 5-day moving average for 30 consecutive days, before ending that streak on 1st December. That is an impressive move and has all the hallmarks of a short covering rally. The bulls appear to have regained the upper hand for now. However, if the majority holding a short position against the S&P 500 have been carried out, we may have a vacuum below current price. Short sellers are a necessary part of any functioning market and have the effect of slowing down a stock market in decline, as the shorts must always buy to cover their initial sale. When the stock market trades like it has done for the past few weeks and the shorts get run over, often the real move (lower in this case) only occurs afterwards. It doesn't always have to happen this way of course, but we are not out of the woods yet. Let's take a look at some charts to see how stock markets around the world are setting up today. It has been a roller coaster year for US equity investors. The S&P 500 returned +9% through September before falling out of bed in October and giving up all the gains for the year. Stocks then rocketed out of those October lows and the S&P 500 is now back to +10% YTD. A strong US dollar versus the Euro has added another +10% for unhedged Euro investors. If you have been able to withstand the volatility, 2014 is turning out quite well. However, the US stock market has used up a lot of energy to get to where it is today. The bulls are now fully committed, the bears have covered and the Fed has pulled $1 trillion of financial support. So, who is left to buy? We should find out shortly. While US large cap stocks continue to make new highs, albeit on declining volume, European markets are lagging. The Eurostoxx 600 Index (above left) and the German Dax Index (above right) have failed so far to make new highs along with the S&P 500. It is the same story for the small cap sector with the Russell 2000 in the US making a series of lower highs and lower lows in 2014. These divergences could be signalling that equity markets are running out of steam and due for a pause/consolidation. Also, Brent crude has historically had a strong positive correlation with European equities and Brent crude is now plummeting. Either crude oil is about to have a snap back rally or equities are about to roll over. Spain and Italy have traded in a wide range since the 2008 financial crisis. While stock markets in the US and many across Asia have tripled or more since the 2009 lows, Spain and Italy trade at less than half their prior peaks today... six years into the current equity bull market. The outlook for Europe is challenging as we head into 2015. The region is forecast to grow by only 1%, versus 2.5%-3.0% for the US, and deflationary risks are rising. We expect EU equity markets to struggle next year. However, the Euro has fallen by -10% versus the US dollar in 2014, which should benefit export-oriented companies in the region and further Euro weakness in 2015 could prove a catalyst for EU stocks. Much will depend on the ECB. There is precedent here. The set up across many EU stock markets today looks similar to that of Japan in late-2012. The Nikkei had traded in a wide range between 7,000 and 11,000 from 2009-2012 but then broke higher in November 2012. The catalyst was Japanese central bank money printing. The Nikkei went on to double in JPY terms over the next 24 months while the Japanese Yen collapsed by -40% versus the USD. 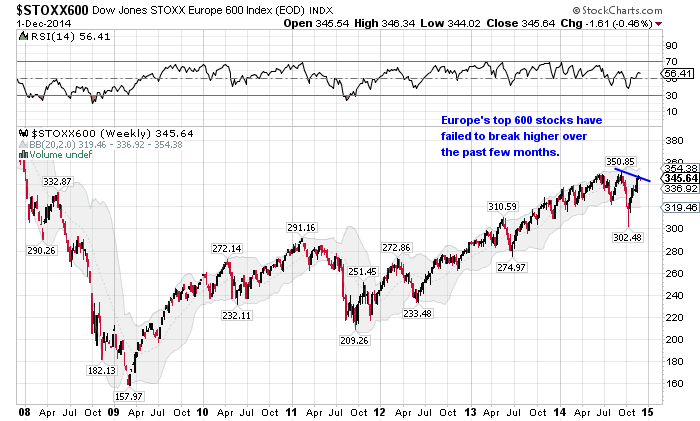 While we don't expect a similar outcome for Eurozone stocks this time, it cannot be ruled out. We are watching the EU currency and stock markets closely for clues. For now, we remain defensively positioned in our Active Asset Allocator investment strategy. We are also reducing the allocation to absolute return bonds from 30% to 20% and increasing the allocation to gold from 20% to 30% ahead of what we expect will be a strong period for precious metals in the months ahead. We would like to include an allocation to emerging market debt in our AAA model but today is not the time, as emerging market debt has already rallied sharply over the past 18 months and offers no real margin of safety. The same is true for high-yield (a.k.a. junk) bonds. Investors are reaching for yield in a zero interest rate world and will pay a heavy price when the market turns. It could in fact be turning now. The Barclays High Yield Bond Index below is rolling over and has not confirmed the recent highs in the S&P 500. Risks are rising, buyer beware. The volatility in precious metals has picked up sharply in recent weeks. Buyers and sellers are battling it out, which is often a signal that an intermediate-term trend change is at hand. Last Friday, gold fell $36 from $1,200 to $1,164. Then, following the Swiss referendum over the weekend, where the Swiss voted against a proposal to back the Swiss Franc with gold, on Monday morning gold fell another $22 to $1,142. The gold bears were sure gold would fall sharply following news from Switzerland, but the reverse happened. 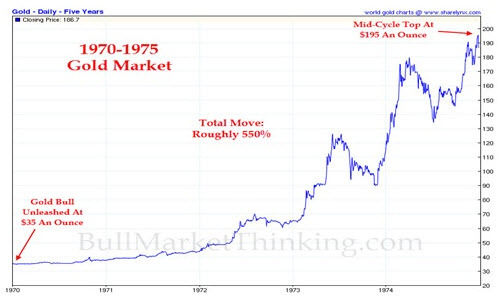 We experienced a dramatic $80 rise in the gold price back above $1,200, which is where we find ourselves today. Too many bears were crowding the short side of the market and were forced to cover. 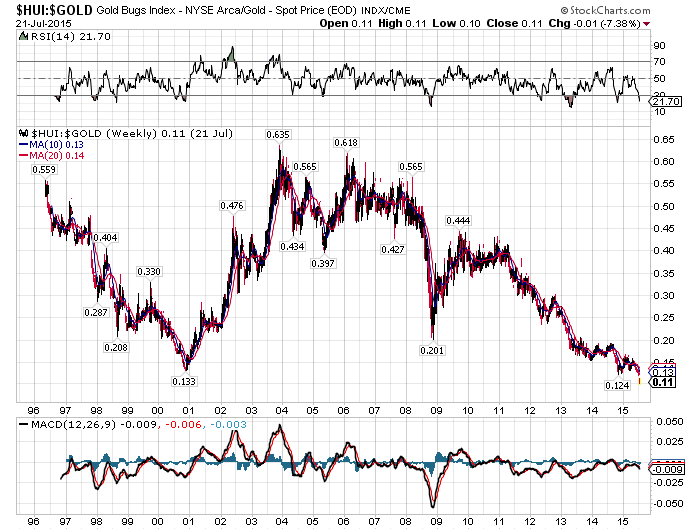 An interesting set up is now occurring in the gold market. The USD gold price has made a series of lower lows over the past three years, but selling pressure is easing, as can be seen in the chart above (RSI and MACD indicators). The public today still believes it makes little sense to invest in gold at exactly the time when it is needed most. Sentiment will turn and when it does, gold prices will move substantially higher. For brave souls, the gold miners have enormous potential. Gold mining companies today trade at the same price relative to gold as they did when the gold bull market began over a decade ago. Mining is a notoriously difficult business but with crude oil prices falling - a major input cost in the mining business - and gold prices set to rise, certain gold miners offer incredible value today.